To ask a question during the live broadcast, call 1-816-301-6304. Be sure to turn off the sound of your computer when calling! New Foundation Unity is a discipleship program. Eleanor wants to help you on your journey. She encourages you to email her at reveleanor@gmail.com or to call her at 1-816-301-6304 to receive materials and ask questions. If for some reason the broadcast does not work, try clicking here. This livestream is such a great way of sharing your knowledge!You have a great way of making concepts that can seem initially overwhelming and complex seem so relatable. Thanks! Hi Rev. Eleanor and Mark. I am watching the broadcasts all the way from up here in Canada and I can't tell you how grateful I am to have found this website and Eleanor's classes. It has been a spiritual lifeline for me. Reading the wealth of information available and following the broadcasts and e-mailing questions to Eleanor I feel I have had a first rate education on Unity history, beliefs and methods. Now I am finally able to put all this knowledge into practice in a clear and logical way and my personal relationship with Spirit grows deeper every day. "Ye shall KNOW the truth and it shall set you free!" Thank you Eleanor for another wonderful lesson. You are a gift to all of us who seek clarity and understanding of the scriptures. I affirm that your audience in cyber land is growing ten fold. You truly are an instrument of the Holy Spirit at work. Wish I had found this sooner. Great lesson and I really enjoyed it, all the way from Australia. I have just finished SEE Bible Interpretation of Hebrews. I wish I had known about these lessons sooner. But still wonderful to review this important info. Thank you, enjoyed my first class so much. Looking forward to learning more and strengthening my relationship with the Bible. Rev. 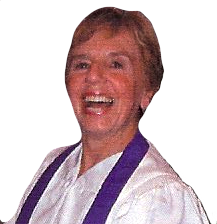 Eleanor Fleming is an ordained Unity minister and the founder of New Foundation Unity. She is also a Reiki Master in the Usui System of Natural Healing and holds a Ph.D. in Energy Medicine from Greenwich and Holos Universities. Inspired by the story of Unity and Myrtle Fillmore’s healing, Rev. Fleming began the New Foundation Unity to help people connect with the roots of Unity and restore the practice of spiritual healing. New Foundation Unity is a ministry based on silence, metaphysical Bible study and healing. It is "built on the foundation of the apostles and prophets, with Christ Jesus himself as the chief cornerstone." Ephesians 2:10-22. It's purpose is to provide the spiritual tools to do the "greater works" promised by Jesus to his disciples. The fulfillment of that promise comes through developing consciousness in the Practice of the Silence and applying Truth principles to daily life. My intention is to follow the Methods and Ideals for Conducting Centers and Study Classes that Charles and Myrtle gave to us many years ago. Part Five on Finances reads, The Spirit of giving functions best only when it is left entirely free. You would not have a generous feeling about giving something in return for a valuable thing that you had received, if you were conscious that the giver expected that you would give something in return. My hope is that all will give to that which they love. Click Here to contribute to New Foundation Unity.